Yesterday, January 27, the Lilly Ledbetter Fair Pay Act (H.R. 12/S. 181) was sent to President Obama who is expected to sign it tomorrow. This is the culmination of a fight that began in May, 2007, when the US Supreme Court ruled that those suing for redress in pay equity cases must make their claim within 180 days of the first infraction. This bill restores the practice of how the law was previously applied, allowing the last discriminatory paycheck to trigger a complaint, not just the first. Common sense has been restored. The North Carolina delegations in the House and Senate voted along party lines on this bill, Democrats voting for and Republicans against. In the House, Reps. Butterfield, Miller, Price, and Watt were co-sponsors. Reps. Etheridge, McIntyre, Kissell, and Shuler voted for the bill. Reps. Foxx, Coble, Myrick, and McHenry opposed. Rep. Jones (R) did not vote. In the Senate, Sen. Hagan was a co-sponsor. Sen. Burr opposed the bill in the final vote, but he did vote to allow the bill come to the floor (a vote that had failed in 2007). There is one more shoe to drop in this year’s fight for pay equity in Congress. There is a second bill, the Paycheck Fairness Act (H.R. 12/S. 182), that has passed the House, but has yet to be addressed by the Senate. This will have more far reaching effects in providing for enforcement of equal pay laws already on the books. Rep. Shuler joined the cosponsors of H.R. 11, and the vote in the house and the votes were the same as on the Ledbetter bill. Write Senators Hagan and Burr about the S. 181 votes and ask them to support the Pay Check Fairness Act. Send a friend a Keep the Change (until Women have Real Change) e-card to raise awareness of the issue. If you haven’t already, sign up for the AAUW Action Network – be sure you’re notified when quick action is needed to affect votes in Congress. Review AAUW’s Pay Equity Resource Kit and plan an even or project tied to Equal Pay Day, April 28, 2009. Pull the Sunday, Jan. 18 issue of Parade Magazine out of the recycling bin and use it’s artice on Pay Equity (quoting AAUW’s Lisa Maatz) to start conversations on the issue with your friends and neighbors. 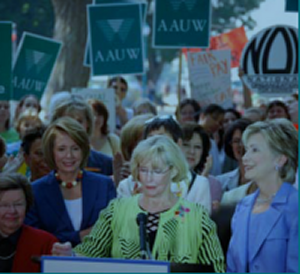 Plan to attend the 2009 AAUW Convention in St. Louis, June 26-28, and hear Lilly Ledbetter’s story in person. What else are you or other members of your branch doing to support this key AAUW initiative? Post in the comments, or write info@aauwnc.org.